This image was photographed at Sand Castle Winery. Sand Castle Winery is a really cool Bucks County Wedding Venue with breathtaking views, and an amazing but unique landscape. This couple had their wedding reception in the vineyard during the summer time. 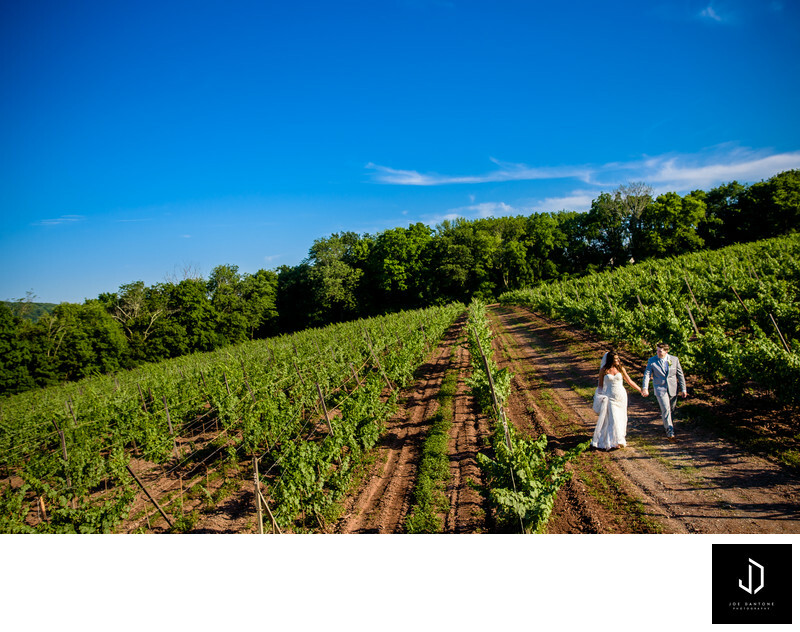 We had a lot of sunlight so by the time we arrived back at Sand Castle Winery for their portraits after the ceremony, the sun spilled this beautiful warm glowing light across the Bucks County vineyard. Sand Castle Winery was a fun location to photographing because of the property overlooking the Delaware River and the beautiful Bucks County Landscape. Most wedding venues in Bucks county have some fantastic character and more likely than not, have something very unique about them. For Sand Castle Winery, the best part about this venue is that its ontop of a mountain with an amazing view of the Delaware River, all the while sitting in a winery. Location: 755 River Rd, Erwinna, PA 18920.